Posts are used for any type of content that is time sensitive or date driven. This can be content such as blog entries, articles, or news stories. Posts are naturally displayed by date in descending order and can be organized through categories and tags. They are also available in the RSS feed. Time sensitive information tends to be very social and can encourage conversation through the comments section of the post. To add a new post we first need to navigate to Posts in our main navigation bar. You can hover over Posts and click Add New or All Posts. You can click directly on Posts as well. If you clicked on Posts or All Posts, you will have to click Add New on the next page. Let's assume we clicked on All Posts so that we can see how our posts are displayed. From here we can see quite a bit of information about our posts. We can see the Title of the page, the Author, Categories and Tags assigned to the page, Comments, and Published date. We can also see SEO information created through the Yoast Plugin which you can learn more about here. If you've already created your page and need to make edits, you can simply click on the title, or hover over the title for more options. 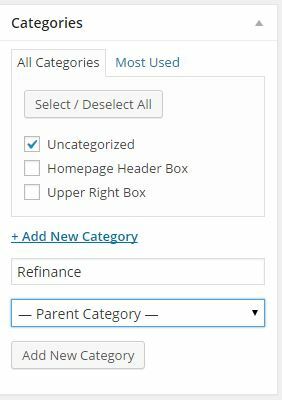 From here you can also make edits to multiple posts, such as updating categories, through the Bulk Edit function. 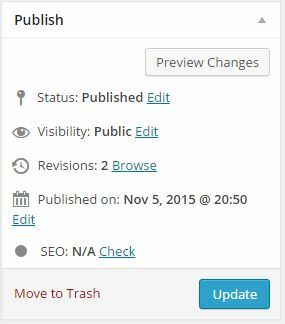 You can also filter posts by date, category, and SEO score. For a more detailed overview of this section, please see our All Posts Overview article. Now that we understand how our posts are listed, we can click Add New to create a new post. The first field we can add will be the post title. 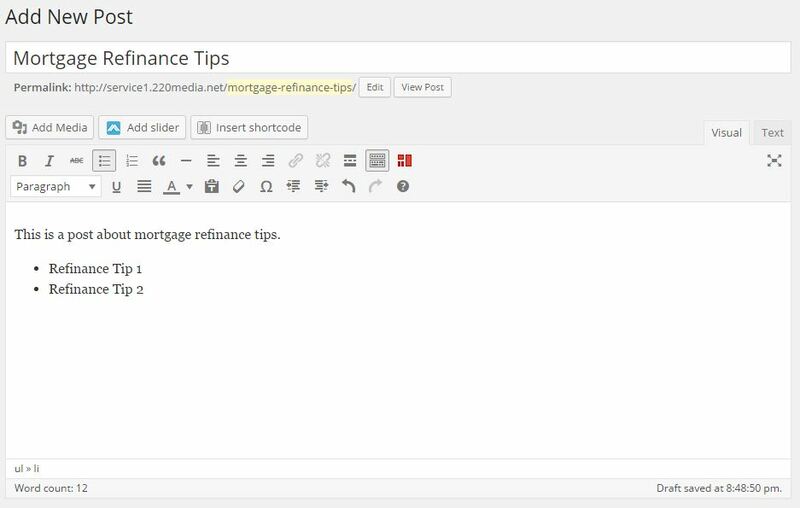 We have titled this post "Mortgage Refinance Tips". The post URL by default will be the same as title, although you can edit this if necessary. Our main post content will be controlled in the larger editing box. Here we will add all of our content and media as well as make changes to formatting. Off to the right side of our primary editor, there are some additional sections to further control the post. Categorizing posts allows for better organization and makes it easier for your site visitors to find the information they are looking for. 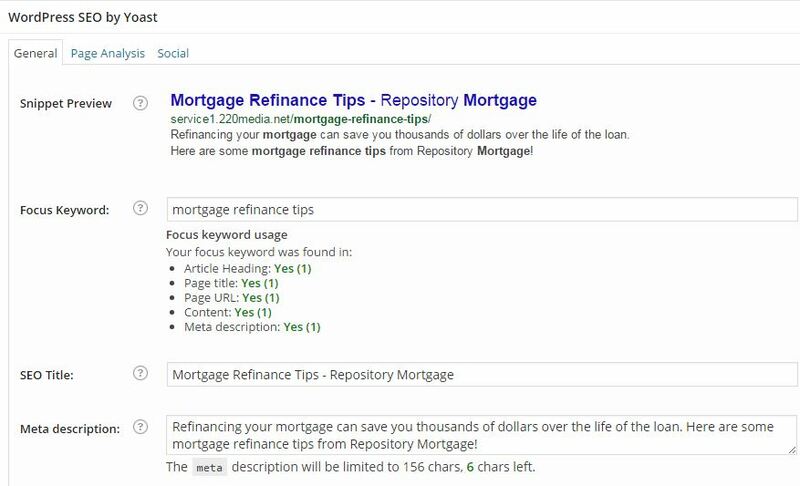 We created a new post titled "Mortgage Refinance Tips" but you will see below to the left that there wasn't an appropriate category for our post. If we click Add New Category we can add one that better classifies our post. 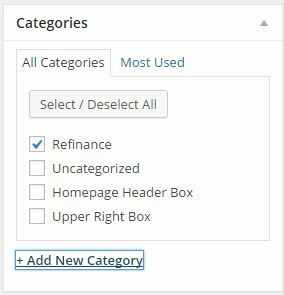 We've added "Refinance" as a category for this post. After we click the Add New Category button, it will appear in our list for us to select. You can select multiple categories if you would like but you do not want to select too many. Categories should be fairly general, while Tags, which we will cover next, will be used to describe the post in greater detail. Tags are another way to categorize posts. To avoid having an excessive number of categories, tags are used to provide more detail about the post. The total number of tags and categories combined shouldn't exceed 15. 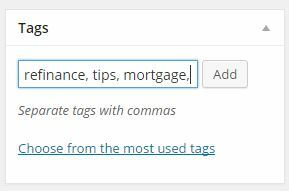 To add tags, simply type the tags you wish to use, separated by a comma, and click add. After they are added, the list of tags will be displayed, each with a small X next to them. Clicking the X will remove the tag. 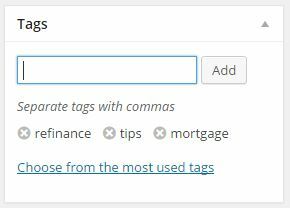 You can also select a tag from your most used tags. Next we can update Sidebar Options. Posts are assigned default sidebars when created, but if you wanted to use a unique sidebar for a certain post, that can be accomplished here. Posts can be assigned a featured image. 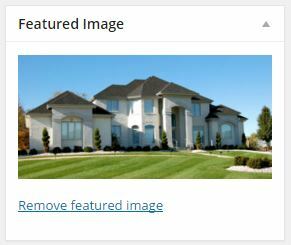 To add an image simply click Set Featured Image and select the image you want to use from your media files. Featured images can be used throughout the site in various places. As an example, below is one of 3 sections from the homepage of our site. 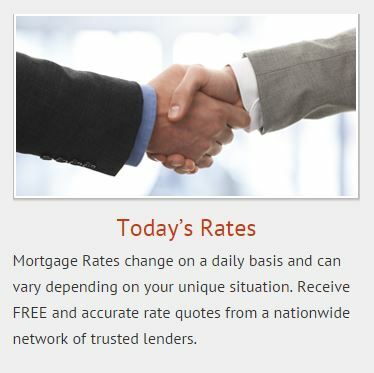 This section is actually a widget that displays the Featured Image of our Today's Rates page along with a snippet about the page. We can choose a unique layout for each page or post on our site. 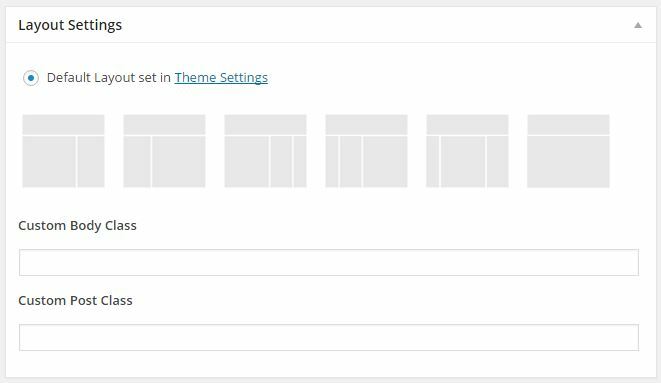 Using the default layout will create consistency throughout the site, however there may be times when a different layout is needed. This can be changed here. The Yoast SEO plugin is a powerful tool to control many SEO-related elements of our posts and pages. We have dedicated a page entirely to using the Yoast SEO plugin which you can view here. 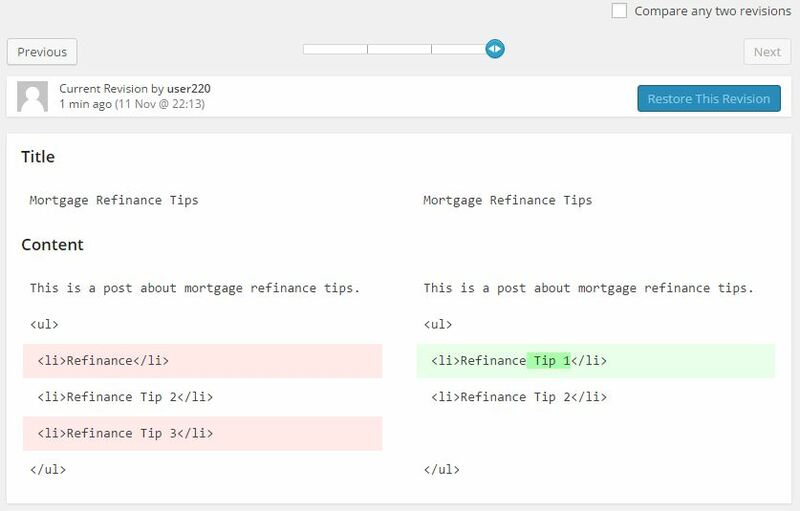 We have completed the fields for our Mortgage Refinance Tips which you can see below. 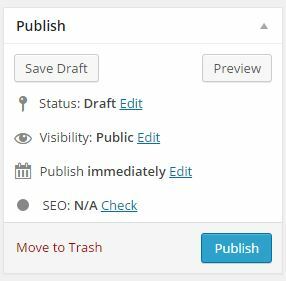 The Publish tab gives us quite a few options for how and when we want to display our post. Sometimes we will need to revisit our post a few times before we are able to complete it. Here we can save our post as a draft to save our content without making it available on our site. Perhaps you have finished the post but don't want it to be published until later in the week. You can schedule this by clicking Edit next to Publish. This allows you to publish your post without having to log back in and do so manually. You can also control who can see your post under the Visibility settings. Posts can be Public, Private, or Password Protected. If you have updated all of the information in the Yoast SEO section above, you can check the score here as well. Once you made the changes needed, click Publish! If we go back into our post after it has been published. We'll notice the Publish tab has changed a bit. We can see the new status, current visibility, and when we published the post. One very important new option is the Revisions section. Clicking Browse next to revisions will allow us to see previous versions of our post. This is important if we happened to accidentally delete information and we need to recover it. If we click on Browse to go into our Revisions, we can see our current post as well as past updates. The most current version is on the right, while the previous version is on the left. You will notice below that some lines are highlighted. Highlighted information shows you what has been changed since the previous revision. In our example below, we forgot to add "Tip 1" to our first bullet, and we decided we didn't want the third tip. You can see that all of these lines are highlighted. Clicking the Previous button will take you to the next most recent revision. 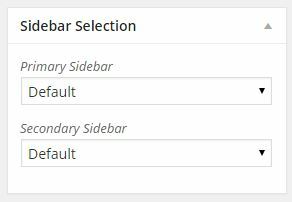 You can also use the slider to scroll between revisions, or use the Compare any two revisions check box to compare select revisions. There are a few other fields that we can control from the posts page such as Dynamik Labels, and Scripts. If you do need to make adjustments in any of these areas, please contact our Customer Service team for further help.